The Solid Signal Blog welcomes new guest contributor Jake Buckler! Hello. My name is Jake Buckler and I know just enough about TV antennas to make me dangerous. Seriously! Consider my first experience with these devices. It took place sometime between 1979 and 1983. The Buckler family made the switch to cable TV, which meant our TV antenna had to go. I didn’t see what the big hurry was and neither did my dad. But when Mom said it was an eyesore – and that the neighbors took theirs down – the fate of the ol’ metal giant was sealed. Dad caved, and his only consolation prize was that he had me to help him with the task. We were the proud owners of a colossal log periodic antenna. (I now know this thanks to Stuart’s blog post.) Being a hyperactive, overly-imaginative kid, I always thought that it looked like an Imperial Star Destroyer. The only thing it would’ve destroyed were Mom’s precious rosebushes nearby. This is why Dad said we couldn’t just cut the huge, metal stand and watch the whole thing crash to the ground. Did I mention I was a hyperactive, overly-imaginative child who’d recently seen Star Wars? The moment that aluminum contraption hit my hands, I tore off across the roof. In my zeal, I didn’t realize that I was knocking shingles off the roof! My Dad did. He shouted for me to stop. I couldn’t hear him over the sounds of laser cannons and thrust blasters emitting from my mouth. Pew! Pew! Pew! As I turned my spaceship around for another strafing run, I saw Dad coming at me full bore. In a moment of panic, I heaved that old antenna as if it were a paper airplane. But it didn’t fly like one, and it didn’t land like one, either. The telltale sound of a car window being shattered was quickly followed by a rather creative string of words from my father’s mouth. Dad ran right past me toward the edge of the roof. Unfortunately, he was going too fast. A loose shingle – which may or may not have been caused by me – sent him off the roof. I nervously peered over the edge to see shingles in our yard, my father on the grass and that gigantic antenna growing out the windshield of my mother’s car. If there was an up-side to all of this, it’s that Dad wasn’t hurt, and Mom and Grandma were there to mitigate his temper. Dad and I went back to dismantling what was left of the metal tower and concrete base, piece by piece. He then put the big, silver beast in the back of his pickup and hauled it to the scrapyard. I don’t remember if he got enough money to cover the cost of mom’s windshield, though! Free HDTV for life for less than the cost of one monthly cable bill. Local news and weather alerts, sports and the top ten most-watched shows. Easy way to deliver programming to TVs not hooked up to cable or satellite. 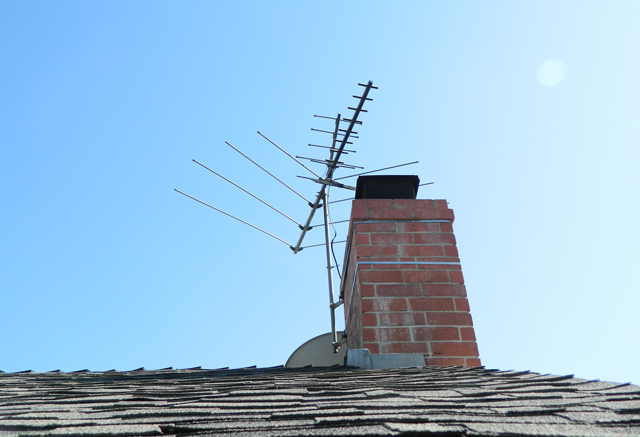 Thanks to my colleague Stuart Sweet, this blog is filled with helpful information about HDTV antennas and related topics. I invite you to poke around, read some of his amazing content and learn more about the benefits of “cutting the cord.” I know I will. I’ll also contribute to this blog, as well. I’m both proud and happy to join Stuart in the mission of educating people about TV antennas and all the benefits they offer. Just don’t ask me to install one of these units onto your home! Jake survived this and many other youthful mishaps to become a valued member of the Solid Signal team. NICE AND EASY: Can you use an indoor antenna outdoors?